Ya know this really breaks my heart. You listen to so much complaining here in the Good'Ol U.S.A. I have done so myself at times. 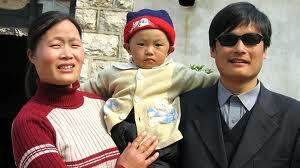 To hear Chen Guangcheng's story just makes me feel not only embarrassed by my own complaining but I really feel for this guy and his family. I can't believe there isn't anything we can do. And while we as US citizens may not know the whole behind the scenes workings it sure appears that our administration is playing the 'head in the sand' game. There must be something we can do. I will offer up my daily rosaries until resolution of this matter. Please keep Chen and his family in your prayers.